Details at the end of this review on how to enter to win a copy of Borrowed Crime. There is also a link to purchase the book where a portion goes to help support KRL & indie bookstore Mysterious Galaxy. As winter descends on Chilson, Michigan, no one knows the value of the district library’s bookmobile more than its assistant director, Minnie Hamilton. Having lost a grant, and with an expected bequest being contested by disgruntled heirs, Minnie has only six months of operating funds to keep her beloved bookmobile running. For legal and safety reasons she’s obligated to enlist a volunteer to accompany her on her visits to snowy locations, and the unauthorized library cat Eddie unfortunately does not count. A last-minute switch has construction worker Roger Moore replacing his wife, and although he proves to be far more preferable than his aggressively helpful spouse, his volunteerism is shockingly cut short by a gunshot on the opening day of hunting season. When Roger’s litigation-happy sister files a negligence lawsuit, Minnie horrifically hopes that he was a targeted murder victim to avoid liability and blame. 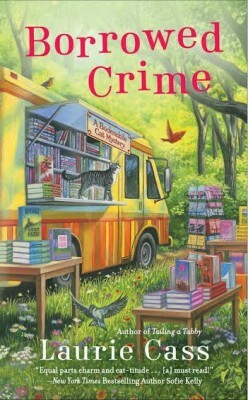 While she’s tasked with proving that someone intended to kill either Roger or his wife, Minnie’s loyal library staff is busy investigating whether or not their director has deduced that Eddie has become the major attraction for bookmobile patrons. What is so enjoyable about this series is how accurately Cass captures the quintessential character of a librarian. She constantly has to juggle a budget, deal with irksome patrons, and resist making unsolicited reading recommendations. Minnie also visibly shudders at the thought of anyone writing in books, and winces whenever she’s forced to wait without a book in hand. Minnie could use a little emotional support, her boyfriend Dr. Tucker Kleinow’s busy schedule has been keeping them apart, though that does make it easier to navigate than his allergic reaction to Eddie’s fur. Minnie and Eddie resemble an old married couple as they exasperate one another—but are always ready to help one another in a crunch. In fact, if Minnie were a little more adept at interpretation, she’d realize that Eddie might be the smartest one of them all. 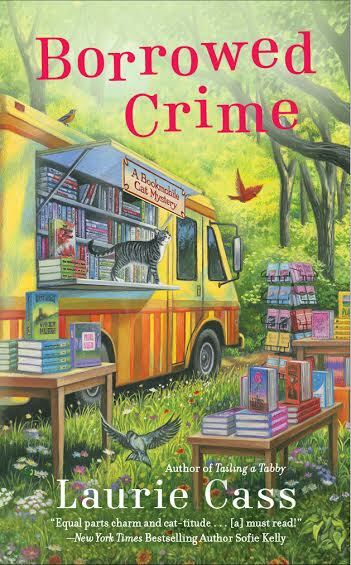 A wry sense of humor, a love of books, and an affectionate tolerance for Eddie’s supremacy in the bookmobile ensure that readers will continue to enjoy Minnie and her adventures. To enter to win a copy of Borrowed Crime, simply email KRL at krlcontests@gmail[dot]com by replacing the [dot] with a period, and with the subject line “Borrowed,” or comment on this article. A winner will be chosen April 11, 2015. U.S. residents only. If entering via email please include your mailing address, and if via comment please include your email address. Oh boy, if I don’t win,another one to go in my purchase account! Thanks, I adore the cover! Adorable cover and …. the inside story sounds pretty good, too! ???? Bookmobiles were my lifeline when I was a child in rural Indiana. Would love to win this one. This sounds like a great addition to the series! I love watching Minnie and Eddie, and definitely don’t want to see the book mobile make its last journey. Thank you for the great review and bringing to light ideas I hadn’t considered when reading earlier mysteries! I would be thrilled to win and review this, also!